It's always fun to wear items that really do not need much to create a look because it is a character on its own, this cobalt skirt with the side peplum needed a much more simple top to balance out the skirt. Though I did think about pairing the peplum with a brighter top but that would be a lot of color, on top of the detailing on the skirt so I settled for a subtle sweater with texture to give the look a little depth. A brighter accessory was instead a better choice for a pop of color. My logic behind dressing is to add an "unexpected touch" -- that for me is my signature, I suppose. Casual but still dressed up at the same time. I always prefer to go against the grain, guess that is the little rebel in me. And by the way, yes, that is tons of heavy fog as my backdrop. We were given a few days of this weather so a little heads up for upcoming posts. Happy #Scandal day my friends! Wonderful !!!!!!!! 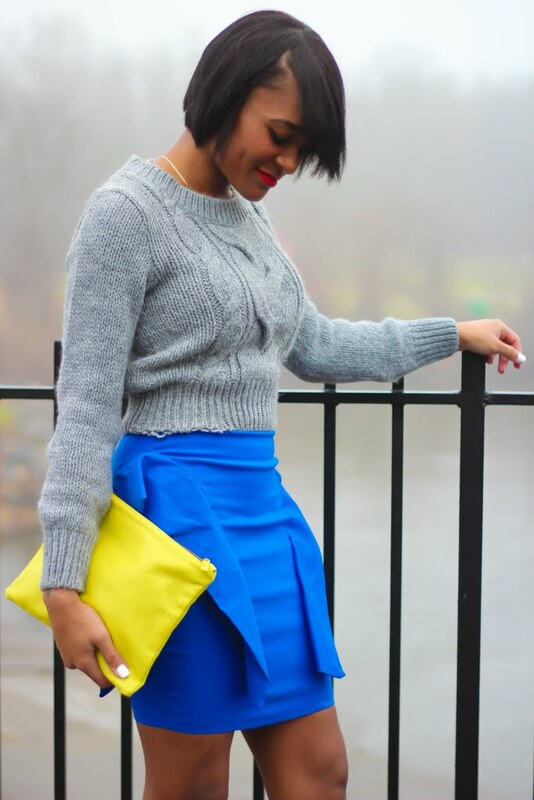 Love yellow and blue and the skirt is amazing! love the color of your skirt!! I've always been a fan of your chic looks!!! You look awesome love the color combo...well done again. dear your style is amazing, now i´m your new follower! beautiful blog! Love that clutch girly - such a nice pop on the outfit! You look stunning and that is a great skirt. Adoring the clutch too! Amazing pics. Love the outfit! perfection love this entire look the skirt is awesome! That skirt is delightful! You look so cute. You look very pretty! Nice skirt! So casual but yet super chic!! Love the outfit.